It did not take long to find out who in Not So Hot Lanta, if anyone, was going to stop the juggernauts-on-Saturday Louisville Cardinals. The guy(s) in charge of the shot clock in the gym. After Tech went up 2 zed on a second chance score during the game’s first possession, before the Cards ever had the rock in their hands, the game was delayed while the timepieces in the facility were synchronized. Five minutes? Ten minutes? Seemed interminable. The visitors, again in black, stood around, waiting to rock. Which they did, as in the DeanDome, as soon as the tilt recommenced. 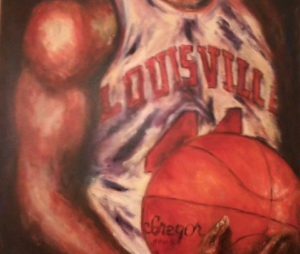 Malik Williams found Dwayne Sutton for a deuce on the U of L’s first attack. Khwan Fore drove for a bucket on the next. Jordan Nwora netted a floater next time down court, following it with triple on the next trip. Four trips. Four shots. Four makes. General ineptitude by the more Wreck than Ramblin’ hometowners. At 15:07, after several errant Cardinal attempts, Williams drained a trey. Twelve seconds later, Christen Cunningham converted a couple at the charity line. 14-4. Ball game. Tech never came closer the rest of way. Even after slog of a segment that seemed more neverending than fixing the clocks. The Cards went 0/6. The Yellow Jackets coughed it up 7 times. The do-I-dare-flip-channels-and-hear-DickieV-call-the-Cats-game interlude blissfully ended with a Nwora flush on a baseline rush. Soon enough the lead reached triple figures. OK, that’s not true, but it felt like it. The Cards were +31 for a time before the break, +27 when it came. They had 13 assists on 17 connections of 34 attempts. Without three players, Josh Pastner simply had nowhere to turn against a U of L team that was steady and ready to take care of biz. Midway through the second stanza of — admit it — a pretty boring game, even for the most ardent Cardinal faithful, Louisville was +38. The only real worries were not getting anybody injured, not developing the bad habits that can develop during such lopsided routs. Let’s now take a minute or two to praise U of L’s new coach and his staff. It is now clear beyond peradventure that Chris Mack is a keeper. What he has done so far with this patchwork contingent is darn near amazing. At 4-1, U of L is now tied for the ACC lead. OK, sure, yeah, along with five others. But still . . .
Mack has ten guys he plays. But Akoy Agau, bless his aging bones, is really just 98.6 on the pines, a practice guy. Darius Perry and VJ King continue to, well, you know, underperform. The former by being too aggressive, the latter because he’s too timid. Which leaves seven contributors, from whom Mack and staff are extracting every ounce of winning play. The Cardinals many flaws are being masked in remarkable ways. Guys in the right spots, being asked to do only what’s within the parameters of their abilities. U of L has inched up to #18 in Ken Pomeroy’s rankings. And are #19 in the more important NCAA NET rankings, which are updated on Mondays. Peril lies ahead. But, so far, so damn good. Some of you readers as long in the tooth as I am might remember NBC newsman Edwin Newman. He was an erudite fellow, a stickler for language. He had a regular segment on the news where he’d rage — calmly of course — about this colloquialism or that which he found to be an affront to the Queen’s English. Being a word guy, I loved to watch him, and, of course, bristled at his narrow view of communication. If the reader or listener understands what you’re saying, that’s all that matters. So what if there’s a split infinitive. Anyway, in sports there’s lots of bastardized lingo, that make sense to those who follow the game. Which brings me to a hoops term that makes many cringe, but I love: “score the ball.” Of course, it doesn’t mean take out a marker or knife and scratch a line on the basketball. It means put it through the damn hoop, and is oft used at a critical time in a game when a tally is imperative. And that brings me to Jordan Nwora. Yesterday, without taking an ill advised shot, he scored 21, on 8/12 accuracy. In the first half. He finished with 25 on 10/16 shooting. This after going off for 35 on 12/16 against BC, and canning 5/10 in the dismantling of Carolina. For the season, he’s hitting 50% of his shots, 41% from beyond the arc. Do we love how Jordan Nwora is scoring the ball? Indeed we do. Take that, Edwin Newman. Christen Cunningham — Oh, wouldn’t we love to have him at the helm for another season or two? — served up 11 assists against Tech. Dwayne Sutton, sort of taken out of the game by GT’s zone, grabbed 8 rebounds, six in the 1st. Malik Williams and Steven Enoch scored points, but also gave up 24 and 11 to James Banks, Tech’s only double figure scorer. I feel compelled to give a thumbs down to the Raycom TV production crew. Shots of coaches on the bench. Uh, guys, there’s a game going on. Replays of inconsequential action. Yo, dudes, there’s live action going on. Full screen graphics over live action. Hey, you guys in the truck, do your jobs. Who taught the directors of basketball game telecasts that the viewers at home want to see close ups of a player after he scores or some clownishly costumed fans in the stands, WHEN THERE’S ACTION ON THE FLOOR?? I have been complaining about this for years! There were countless times when the Cards were a pressing team where we would miss a steal/score after a made basket. I can’t remember any specifics, because we never saw them! It’s one of the many reasons I enjoy attending the games. That and not having to hear Dickie V and others drone on and on about subjects totally unrelated to the action on the floor. I agree with gnash – especially on that last point. When the play play and color guys get to reminiscing about old or new so and so, and miss a key play, it drives me crazy – which some have said is a short drive. You’re preaching to the choir, gnash.